A profound collection of timeless rock grooves inspired by AOR ballads from the golden age of the ’70s and ’80s. While the AOR genre already had gained a big following in the late ’70s and early ’80s rock scene, what made it break through to the mainstream tier and not only conquer the worldwide airwaves but also the movies is largely attributed to ballads. Bands and artists like Peter Cetera, Journey, Foreigner and Toto all had massive worldwide hits with their ballads, putting slick, meticulously produced AOR on the commercial map in an all-new way. Now, rock wasn’t all about being loud, it was just as much about musicality, songwriting, craft and skill – all the common traits of AOR. Drummers became a central part of the sound of this era. Players like Jeff Porcaro, Steve Gadd, Jim Keltner and John Robinson would go on to inspire a whole new generation of drummers around the world. This is where this collection of grooves takes off – with a strong foothold in classic rock, but with that “session musician” quality that often signifies the genre. Expect sturdy, timeless grooves with edge, nuance and finesse – all in tempos and feels perfectly suited for ballads. 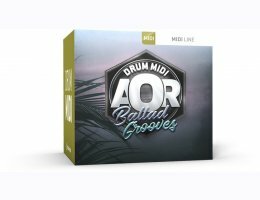 This MIDI pack gives you the ideal foundation for any rock track where you want the drums to have attitude and an extra ounce of sophistication – without getting in the way of the song. Works with EZdrummer, EZdrummer 2, Superior Drummer 2 and Superior Drummer 3 (optimized for 1 kick, 1 snare, 3 rack toms, 1 floor tom, 4 crash cymbals, 1 ride cymbal).